One City. One Contract. is a revolutionary way to do business. A streamlined system built around you makes hosting in Madison a planner’s paradise. No more repetitive negotiations. No more tedious copying of clauses. One contract seamlessly stitches Madison’s hotel brands together. Be revolutionary. Meet in Madison. This is the way planning should be. One city coming together around you to make your meeting thrive. Tired of the tedium of repetitive negotiations? Don’t rewrite indemnification and liability clauses. Don’t spend precious energy mired in inane reiteration. Innovative ideas have always had a home in Madison. And nothing breeds innovation like collaboration. Never before has a city wrapped itself around a planner to create effortless efficiency like this. Big brands and independent hotels unite under a single set of terms. Combining iconic and distinctly-local brands creates an extraordinary experience your guests will rave about. Combining hotels gives your guests full access to one of the world’s happiest cities. 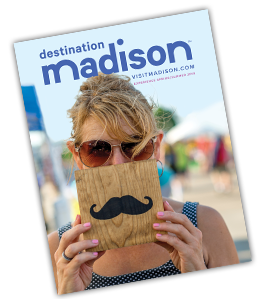 Hotels are spread throughout Madison’s most desirable districts, giving guests a destination depth they’ll remember. From award-winning culinary culture, to unique experiences, they’ll encounter a vibrant city bursting with inspiration - all within a wonderfully-walkable city. Madison makes your meeting exceptional. See why.